Georgiades-Herodotou met, what will happen with the Russian loan…? The Central Bank of Cyprus enters deep waters early on, with the assumption of office by the new Governor Constantinos Herodotou. The latter had a meeting with the Cypriot Minister of Finance Harris Georgiades, where all the open issues were raised, but above all they discussed the need to have an open communication channel between the ministry and the central bank. Something that did not exist with the previous bank governor Chrystalla Georghadji, with which, as it was made known in the background, not just the finance ministry but not even government agents and other banking market players had an communication. The distance kept by the Central Bank of Cyprus was great, so that the above-mentioned unofficial rumors were lurking in the background, considering what Mrs. Giorghadji herself had mentioned when she left her office for affairs which concerned her and saw the light of publicity. 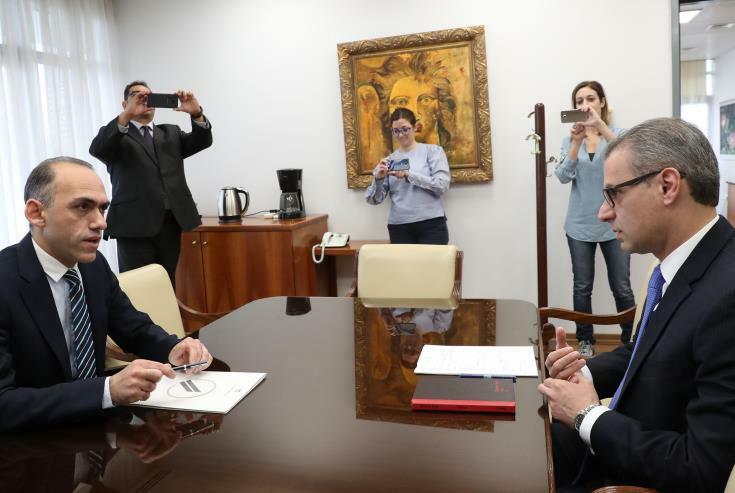 At their first meeting, Georgiades and Herodotou both gave assurances for systematic and regular cooperation between the Government, the Ministry of Finance and the Central Bank, aiming to further safeguard financial stability. It was characterized by Mr. Georgiades as a substantial working meeting, stressing that the co-operation “now enters a new stage”, essentially confirming the intention that exists now on all sides. “The most important thing we have decided is that this collaboration will be systematic and continuous. Obviously there has been a lot of progress in our economy and in the banking system in recent years, but there is still work to be done. In this context, we consider that the institutional co-operation of the CBC with the Government and the Ministry of Finance is necessary”, Haris Georgiadis added, defining the Non-Performing Loans issue as the biggest problem that still exists for the Cypriot economy. In his own statements, Herodotou said that in the framework of the continuation of financial stability, the co-operation with the executive power is imperative and he announced the holding of meetings with the parliamentary parties, saying that there would be communication at all levels. “Communication does not affect the independence of the CBC. Moreover, the isolation does not help, so the communication is legitimate, because that is the only way to ensure, I repeat, the continuation of the financial stability that we have achieved”, he said. What about the Russian loan? One of the cases the Cypriot Ministry of Finance is called to examine is the repayment of the Russian loan which Cyprus had taken amid the fiscal storm in 2011 and before entering the Memorandum. A tranche is due to be paid in 2019, the amount being estimated at € 778 million, the next tranche is due in 2020 and the last one in 2021 with the same amount (the entire loan was € 2.5 billion), followed by a repayment of € 7.2 billion from the memorandum. The Cypriot Finance Ministry is considering issuing a new bond, which will be used to repay this Russian loan. Harris Georgiades himself did not exclude such a possibility. “What I can say is that we are considering and probably we will soon be able to make specific announcements”, he said. The issue, however, is also relate to the Cyprus’ foray into the markets.